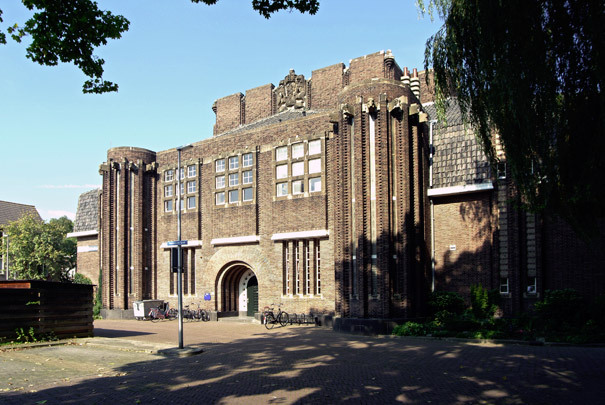 This building was realized during a period when the Ministry of Works and Buildings advocated a more plastic, Amsterdam School style of architecture. The exterior, dominated by semicircular volumes and vertical strips of bricks is, like the interior, copiously decorated with animal heads referring to the building's former function. The interior spaces are grouped around a double-height hall. The striking semicircular extension on the Grift once contained a hall for lectures on veterinary anatomy. These days the building hosts a theatre. Nearby is Crouwel's Clinic for Small Pets.